A loving idea of having one whole family to celebrate Eidulfitri and university graduation in London together has turned into a nightmare. Soon after my family arrived at Heathrow Airport, my father (Mohamad Sahar MHD Noor) suddenly collapsed and things changed since then. I panicked and depressed thinking what could happen to my father as he has no travel insurance. To make matters worse we couldn’t afford the hospital bills in the UK. He was transferred into ICU,Charing Cross Hospital, London and the doctor in charge urged to go for an operation. Despite the money issue, we know that the operation is crucial and need to be carried out immediately. He underwent right frontal external ventricular drain (EVD) to release his brain pressure and to allow the blood to come out from his brain. During that time, he was given sedation, low blood pressure drug and antibiotics. He was suspected of have speaking disorder, unable to move his right body and suffered memory loss. After 3 weeks, he could open both of his eyes and reacted to us when we talked to him but we are not sure whether he understood or it was just unconscious reflex. A few days after that, we received news that my father’s employer agreed to give us an advance to undergo medical treatment in the UK. The advanced given meant so much to us, however after three weeks we were informed that the medical expense amount was capped at £30,000. We still can’t afford to cover the full cost since, at the time of writing; the cost to date has reached approximately £45,000. Currently he is in Hyper Acute Stroke Unit (HASU) ward, Charing Cross Hospital, London whereby he needed to go for therapy sessions, therefore the bills keep accumulating. The doctor has permitted us to bring my father home with the condition that he should be on a stretcher or in a lying position at all times. He can’t sit for a long time and had a tracheostomy. He needs to be accompanied by a doctor and nurse on board as a precaution. Currently we have discussed with Malaysia Airline (MAS), and they advised us to purchase few economy class seats since that is the cheapest option available, and we are now still awaiting further feedback from the Airline. My family and I are humbly asking for your kind prayers for his speedy recovery and would appreciate your financial support to cover his running medical expenses and travelling costs. Your sincere help means a lot to us. My name is Amirah Sahar, from Negeri Sembilan, Malaysia. I am currently a postgraduate research student at Brunel University, London. My father, Mohamad Sahar MHD Noor is a loving father of four and also four grandchildren. He works as a chief clerk at Kolej Kemahiran Tinggi Mara (KKTM), Negeri Sembilan, Malaysia. My mother, Hawiyah Ahmad, is a technician at Jabatan Pengairan dan Saliran, Negeri Sembilan, Malaysia. My eldest brother, Adhwa Sahar is married with three children, however he is about to start his new job. And finally my youngest sister, Atikah Sahar - a fresh graduate and currently seeking for any suitable job. My father likes gardening and house cleaning. Despite all odds, like most parents he is very hardworking on striving for a better future for all his children. He is a loving husband, father and grandfather. Our hope now is that he can be discharged soon so that we can continue his medical treatment back home in Malaysia. Thank you for reading our desperate appeal. We are humbly grateful for your heartfelt compassion and generous support. May the AlMighty bless you and your family onwards and upwards. Ameen. As we do not know the actual costs for my father, any surplus of this fundraising will be donated to charity so that others in-need can benefit as well. Based on the current progress on repatriating Dad home to Malaysia soon (pending few factors to be finalised), the family and I have decided to close our fundraising campaign today. There are few unforeseen issues with Stripe (card payment processor for gofundme) that we must resolve smoothly in the interest of integrity and for our kind donors world-wide as well. That said, we are very grateful and truly overwhelmed by the generous support and kind words from each and everyone of you - family, friends & strangers near and afar. It is impossible for us to name you individually but trust you'd know who you are folks. Our appeal campaign has unexpectedly gone viral & thankfully received positive responses. This proves that there are people out there who care after all. Thank you to all donors. My father is now stable. He can breathe normally and his blood pressure is now stable. He is now undergoing a therapy session in the hospital, although he is only semi-conscious and too weak to move. A few days ago, the doctors did a tracheotomy on him to help him breathe through his windpipe/trachea but now he is slowly recovering to breathe normally through his nose. The doctors will only allow him to fly back to Malaysia with certain special conditions. He needs to be on a stretcher with a doctor and a nurse accompanying him on the the flight. We are awaiting the decision of the Ministry of Health (Malaysia) to send the doctor and nurse to accompany him. Ayah saya kini berada dalam keadaan stabil. Heart rate, blood pressure da pernafasan seperti biase. Kini ayah saya menajalani sesi terapi di hospital kerana ayah saya separuh sedar dan masih lemah untuk bergerak. Ayah saya menjalani trakeostomi iaitu pernafasan melalui kerongkong dan kini ayah saya beransur pulih bernafas melalui hidung. Pihak hospital membenarkan ayah saya balik dengan special condition. Ayah saya perlu menggunakan strecher dan pengiring iaitu doctor dan nurse semasa penerbangan ke Malaysia. Kami menunggu keputusan Kementerian Kesihatan Malaysia untuk menghantar doktor dan nurse bagi menemani ayah saya. Dear friends, we are trying to raise funds for my dad's medical bills. He is now in Charing Cross Hospital, London due to haemorrhage (half of the brain) and is still unconscious. We are trying to get him back to Malaysia as soon as possible as we obtain the doctor's approval. Please support & share. Thank you for your compassion and generosity. guys, if you have a debit card and want to donate, I think you have to activate the card for international use first. applicable only to debit card. if not mistaken. hope this information helps. Cik mira kalau boleh baca ya, saya bayar zakat bagi pihak saya untuk keluarga Sahar....kalau dah baca....tak balas takpa asalkan qabul terima saja. A suggestion to write an appeal letter to Tengku Mukhriz , the Yg DiPertuan Besar NS. He is a Man for d Rakyat . InshaAllah ..AlFatihah n doas for yr dad. Pray for your dad's recovery, and strength and wisdom for your family. Praying for the speedy recovery of En Mohamad Sahar. And to his dear family stay strong and united and God will guide you through. God Bless All of you. 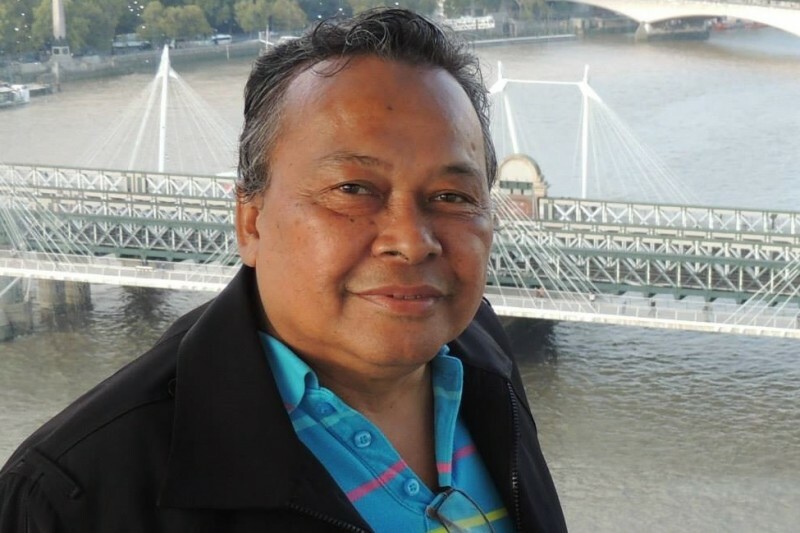 Kak Awie sekeluarga, didoakan semoga segala urusan kepulangan balik ke Malaysia dipermudahkan, dan En Sahar akan segera sembuh. In Shaa Allah.